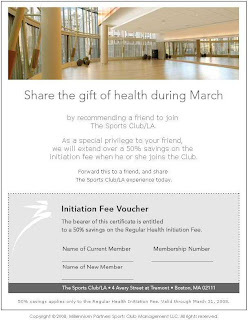 I just received an email from the Sports Club LA extending the 50% off initiation fee promotion for another week until the end of March (3/31). It is a member referral promotion, so anyone that is interested in joining - email me and I'll give you my name and membership number to use as your reference. Click (here) to go to the website that is currently hosting the initiation fee voucher. 0 Response to "Sports Club LA - 50% Off Initiation Fee"